Weatherproof equipment is a prerequisite for any successful adventure tour. Since founding in 1983, High Peak had been concentrating on specialised respiratory-active tents. Since then they have gone on to produce a wide range of products, from beach shells and camel tents to functional backpacks and sleeping bags made from high-tech material. 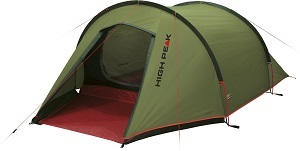 High Peak are specialists in high-performance waterproof equipment for camping and outdoor adventures. Specifically designed for the most demanding of weather conditions and environments, their extensive portfolio of high-end products includes High Peak tents, sleeping bags, sun shade, beach tents, sleeping pads, air beds and more. Browse the wide selection of High Peak products on Addnature.co.uk and start planning your next camping trip! Founded in 1984, High Peak has always homed in on enhancing their customers’ experience when camping to ensure that camping is a fun experience for everyone. No matter why you are going camping, High Peak wants to make sure that you have access to the best equipment. Building on their own longstanding expertise as well as feedback from their customers, they have a clear mission to manufacture products that are affordable but do not sacrifice on quality. Initially, the company focused primarily on tents, but then their product line expanded to items that included sleeping bags, backpacks, air beds, wind and sunshades and more besides. High Peak’s collection of tents and equipment is suited to many different purposes, whether you are going on a family holiday, heading off to a sporting event or music festival, going on an active camping holiday, setting off on a trekking adventure or exploring new horizons. All of High Peak’s products are made from extremely robust and long-lasting materials that can perform well even in challenging weather conditions, have been stringently tested by professionals and are suitable for a range of different environments. Now is the perfect time to start planning your next camping adventure!